It’s a metal album, which most closely fits in the crust/doom genre, but also has elements of progressive, death, and avant guarde metal mixed in. 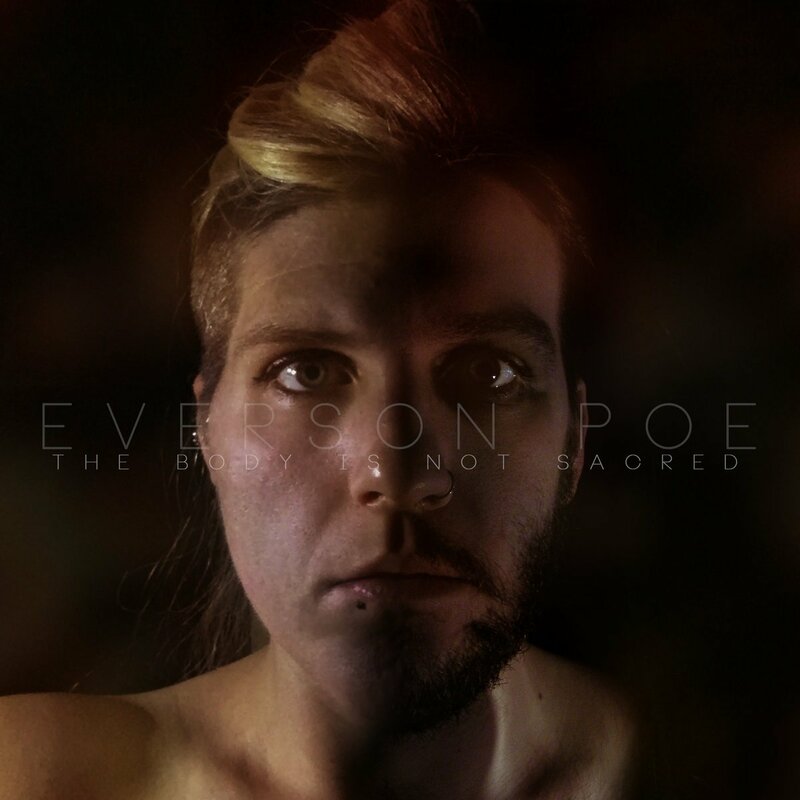 As per most of Everson Poe’s releases, it’s hard to squeeze into one genre. It’s a three disc release, which includes the main mixes on Disc 1, different instrumental songs on Disc 2, and “polite” versions of the main mixes for those of you who aren’t into screaming on Disc 3. You can listen to everything on Bandcamp, Spotify, or anywhere that music streams! For the last decade, Maxwell Shults has recorded a dynamic body of work under the name Everson Poe, exploring everything from doom metal to new wave and even the occasional ’50s slow-dance song. No matter the genre, their music has always been characterized by heaviness—not just in sound (although they certainly embody that, too), but in emotion as well. And their latest project, The Body Is Not Sacred is, without question, their most emotionally heavy work to date. Exploring Maxwell’s gender identity and struggle with gender dysphoria, the music embraces duality to convey two distinct halves living in the same being. Maxwell’s visceral howl—a sound that many would characterize as being typically “masculine”—contrasts with the softer, ethereal vocals of longtime collaborator DEROSNEC. Both of their faces grace the album cover, embracing gender fluidity and making it hard to tell where one person ends and the other begins. The duality extends to the arrangements and lyrics as well. On opener “We All Become Our Sins,” a crackling spoken-word intro and ghostly wail from DEROSNEC quickly give way to Maxwell’s jackhammer drums, guitar, and voice. Likewise, on lead single “No Comfort In The Void,” Maxwell screams the phrase “I strive to reject the masculine in all its forms,” subverting what listeners and critics have come to expect from even the most emotionally in-tune metal music. As usual, thanks so much for listening and I genuinely hope you enjoy the fruits of our hard work!